America’s Boating Club Houston offers this a one-day course, introducing the fun of paddling. Utilizing the Show-Do teaching technique, it covers the basic skills of kayaking on flat, calm water. It covers from entering the kayak to exiting the kayak and all the paddling in-between; including skills such as lifting and carrying, launching, paddling techniques, turning, steering, landing, will include a short tour on one of the Texas Parks and Wildlife Kayaking trails, and a demonstration of a Vessel Safety Check. Yes, it’s a lot of fun. A prerequisite to this course is completing a basic boater safety course. This course must be state approved, recognized by the United States Coast Guard, and approved by the National Association of Boating Law Administrators (NASBLA) - such as our America's Boating Course, the TPWD Boater’s Ed Course, or other NASBLA approved course. It is our view that having a basic boating knowledge, developing kayak skills, and having a Vessel Safety Check work together to improve enjoyment on the water and reduce risks. The basic boating course discusses rules of the road on the water, need for a float plan, weather, and other topics necessary to all boaters. The need for Kayak paddling skills are obvious. And a Vessel Safety Check will make sure that the equipment needed in an emergency is there and in good working order. After all, a lifejacket and a parachute are a lot alike. If you don’t have one when you need one, you are not likely ever to need one again. 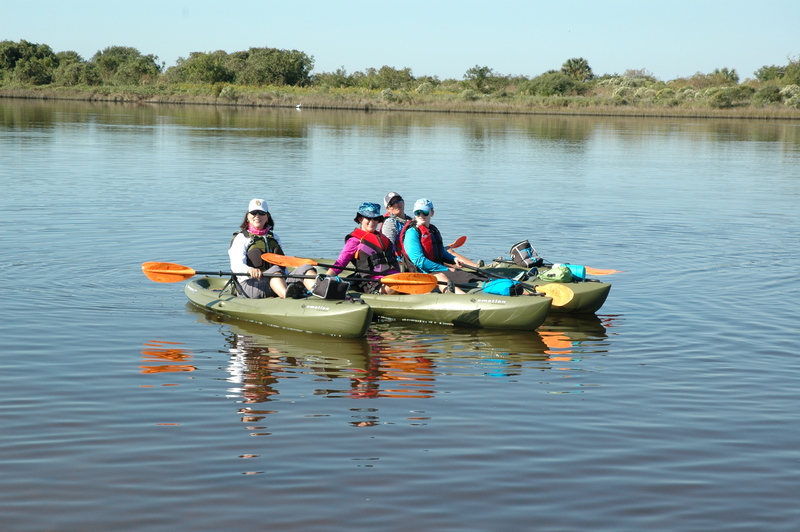 The Class will commence at 9:00 AM at the kayak launch located at Galveston Island State Park. Please arrive early to pay the $5 per-person entrance fee at the Galveston Island State Park Headquarters. Class should be complete by 1:30 PM. We will provide cold water and trail mix as part of the Class. Please wear clothing that will offer protection from the sun. Also, you will get wet. So, clothing should be appropriate. Proper footwear is also very important. Closed-toe water shoes or athletic shoes are required. Please remember that your footwear will get wet. Flip-Flops are not acceptable. Plenty of water, snacks and sunscreen. We encourage an extra set of clothing for after the class. We will provide your life jacket, paddle, kayak, and bad jokes. You provide an interest, and together we will have a fun day. You are more than welcome to use / bring your own kayak, life jacket and paddle. However, cost of course is still the same. If you wish to be certified by the American Canoe Association (ACA) for this class, there are additional steps you will need to take. Your instructor will have that information available at the completion of the class. The ACA has a wide range of classes available. Tuition must be paid during class registration via PayPal or by check/cash prior to the start of the class. Each class is limited to 5 members, the ratio of instructors to students is set by the American Canoe Association and we follow their guide lines. Request a Kayaking Level 1 class be scheduled!